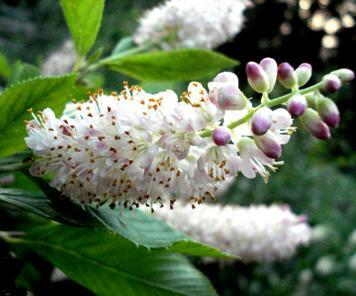 Summersweet is a name that truly conveys the virtues and beauty of this native shrub. This deciduous plant grows to an oval shape with a with a height of 3-8 feet and a spread of 4-6 feet. It features fluffy, bottle-brush like spikes of fragrant white, rose or pink flowers which bloom for 4-6 weeks from mid to late summer and attract a variety of nectar gathering insects. The flower spikes give way to dark brown seed capsules which persist into winter, providing continued interest. It has glossy, dark green leaves which turn a brilliant yellow in the fall. Summersweet makes an excellent, trouble-free shrub which masses well in planting displays in lawns or shrub borders although it will require regular watering until the plant becomes established. It can be easily grown in moist, acidic soils in full sun to part shade and is recommended most for perennial borders or foundation plantings and works especially well in wet areas such as low spots, stream banks or water edges.